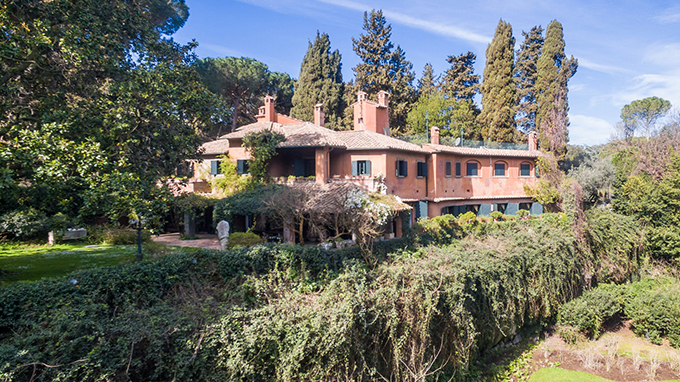 In the Appian Way Archeological Park, in Rome, just ten minutes from the Colosseum, there is this beautiful luxury villa for sale. This property was home to many famous Italian and Hollywood movie star who stayed here while filming in Cinecittà. This complex is composed of a two-storey main villa measuring 680 m2, and a spacious outbuilding located nearby which is, in fact, an independent villa. A magnificent 1-hectare park surrounds this property, it has tall trees and bushes in full bloom and it is home to a stunning heated swimming pool, a garage, and to some apartments which are accessible from two entrances for pedestrians and two for cars that pass through the boundary walls. The main villa was built from a basalt quarry which was employed in Roman times to extract the material used to make roads and now creates a lovely height-difference in the garden. The entrance at garden level features a Roman concrete vault and ancient mosaic floors in a floral pattern. Another access leads to an oval room and then to the main hall with three different parts culminating in a charming Roman room with a tuff vault and a mosaic floor which is currently used as a dining room and connected to the kitchen. From here, a staircase leads to the balconies on the first floor, with black and white mosaic floors. It is possible to reach the upper floor by elevator or by the main staircase; this floor is occupied by the sleeping area and has four bedrooms with bathroom and closet, and a library. The master bedroom has direct access to the terrace and enjoys a beautiful view of the garden. On this floor there is also a romantic glazed winter garden. A walkway in this property's terraced park leads to the second villa, a spacious 500 m2 loft with a big kitchen, two fireplaces, and a reception hall connected to an outdoor arbour. Rome is the capital of Italy and is considered the first megalopolis in human history, heart of important ancient civilizations, capital of the Roman Empire and cradle of the Latin language. A varied territory with a diverse natural scenery is one of its main features, but Rome is, first of all, home to an endless variety of monuments that have great artistic and historical value: the Colosseum, the Imperial Forum, the Pantheon, St. Peter's Cathedral, St. John in Lateran and the Capitoline Hill; various historical buildings, charming fountains, lovely piazzas, historic arches, centuries-old bridges and much more. There are many fashionable streets and exclusive areas in Rome, home to wonderful luxury villas, elegant prestigious apartments and stunning estates of great value. 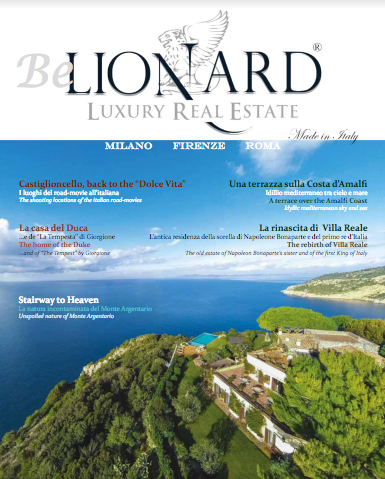 Just a few kilometres from Rome, there is this lovely luxury villa with a park for sale.